Lina Seiche German blockchain and crypto expert is no stranger to the ups and downs of the crypto market. In her opinion, it is the lack of substance in many blockchain projects that, results in their stagnation. And when this happens on a large scale, people generalize and become disinterested in the technology. Speaking to a group of tech gurus, she urged them to open the doors of crypto space and reach out to the business world. There is little use of huddling together and praising these innovative technologies, it is time to show the world what can be achieved by using them. Taking the Glitzkoin diamond blockchain as an example, the German expert discussed how the project had evolved from the industry – technical minds came in much later. The promoter of the project is a second generation diamond veteran, well versed in the supply and demand side of the glittering stone. With clearly defined objectives for the project, it was not very tough to put together a team of tech experts. The project is today, cruising through the development phase. The DiaEx diamond exchange is due to be implemented in Q4 of 2018. In her opinion, blockchain projects that are focused on creating a positive impact on real world business, might be a bit tougher to build and implement but, they are the future. As the crypto world opens up, it will become clear that there are other (non technical) challenges, which can be as tough as developing an application. Getting an established industry to accept a technology that is awesome but almost brand new, can never be an easy task. Again citing Glitzkoin as an example, Line Seiche had a suggestion to make regarding the project team configuration. While it might not always be possible to get a prominent personality from the industry to promote the project, getting an industry insider aboard the team might be a feasible option. This move will ensure that the development team is more focused on developing the right applications. A team member with a close connection to the related business, will also prove to be useful in the testing and implementation phase. While complementing the crypto community on being very interactive and expressive, she noted that this was happening within the modestly sized community. Interaction between individuals with similar ideas, thoughts, skills, knowledge and interests is generally not challenging. The business community on the other hand, needs solutions that will improve performance or profitability – interest in technology is generally quite low. Crypto minds will need to work on a strategy to reach across to businesses. Glitzkoin happens to be one of the very few industry based blockchain projects, that has been promoted by a veteran from the industry. The project includes the development of a fully functional diamond blockchain (nicknamed DiaEx) that, supports B2B and B2C diamond trade. Buyers and sellers of all sizes and located at any point on the globe, can transact on the platform without the need for brokers or middlemen. The GTN token launched as part of the project, will be the mode of payment on the DiaEx trading platform. Having successfully completed its ICO in June 2018 at a price of $0.20, the GTN token is now trading on Stellar based exchanges. 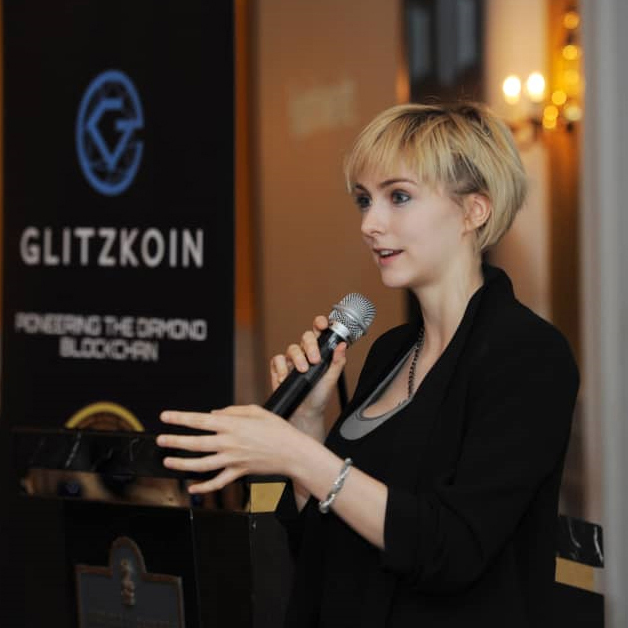 The strong support that the Glitzkoin project has received from the crypto community, continues through the development phase. This is apparent when you review the trading price range for the GTN token – it hovers around the $0.18 to $0.22 range. Very impressive considering the fact that, many cryptos launched during the same time, have lost around 50% to 80% of their ICO value.